Wetlands Offer Flood Protection and So Much More! Northwest Indiana experienced extensive flooding in February, April, May and July of this year. Is this the new norm? What can we do to build resilience and decrease vulnerability to floods? These and many more questions continue to be raised. For our part, we want to highlight the work that we are doing to increase resilience and adaptive capacity in the region and also offer a close-up look at what features on our landscape provide the best protection from flooding. Precipitation events are already outside of historical norms and will continue to get wilder. Under climate change scenarios put forth by the Purdue Climate Change Research Center (PCCRC) and the third National Climate Assessment, more extreme precipitation events are likely to continue. According to the ‘Climate Change Trends and Vulnerabilities’ assessment conducted by the National Park Service Climate Change Response Program, precipitation is increasing 18% per century in the Indiana dunes region, with the biggest increase in winter. Heavy precipitation events mean more flooding in the future. If this past year’s floods are a new norm, communities need to think fast about how the landscape is managed to mitigate flood risks. Flooding in areas that used to be wetlands is nothing new. Damage from the massive 1993 floods along the Mississippi River would have been less severe if the area’s wetlands hadn’t been drained extensively for agriculture. It’s been estimated that prior to the 1780’s, 24% of Indiana’s surface area was wetland; today about 3.5% is wetland. Most wetlands were drained for agricultural activities, with others converted for industrial, municipal, or transportation use. However, because of the efforts of conservation organizations, state and federal natural resource agencies, and strong environmental regulations, remaining wetlands are priorities for protection and mitigation from increased development. Save the Dunes and partners are actively working on restoration projects across the region that will restore wetlands. These projects increase the functionality, water storage capacity, flood protection, and water quality of wetlands while improving habitat available for the remarkably biodiverse plant and animal communities they support. So, let’s get our feet wet (apologies for the pun!) and learn about our wetlands. We’ll all be more resilient when we understand the role our natural environment plays in protecting the vitality of our region. Wetlands are remarkable in their diversity of forms, from bogs to fens to marshes to swamps to wet prairies, and Northwest Indiana has them all! We even boast access to pannes, a type of wetland only found in two places on Earth. But can you tell the difference between a bog and a fen? Did you know that our famous Cowles Bog is actually a fen?? Read on to learn the characteristics of these different types of wetlands and become a master of your landscape. Bogs have the outstanding potential of developing floating sphagnum peat moss mats several feet thick! These develop non-flowing, to very slow flowing water that fluctuates with the seasons, but generally, the water table is very high. They are fed by groundwater and are home to fascinating plant species including mosses, ferns and carnivorous plants. The water in bogs is very acidic and has few mineral nutrients, which means that only plants with special adaptations for these conditions may thrive. Mosses are the first colonizers of land and it is no surprise that they do quite well in bogs. Ferns need moist environments for their reproductive cycle which helps to explain their presence, while carnivorous plants are able to derive nutrients from the insects they trap overcoming the low nutrient status of the boggy soils. Be sure to use a guided tour if you want to walk on a floating peat mat in a bog. If you fall through, there will be nothing to grab on to pull yourself out! Indeed, bogs in the UK are sites where ancient people have been found largely preserved (due to the lack of oxygen and decay) after falling to their doom in a bog! Just for fun, here’s a wonderful Irish tune all about a bog. Enjoy! Fens are wetlands that are covered with grasses, sedges, reeds, wildflowers and shrubs. They are also groundwater fed, which means the water fluctuates with the seasons and the water flows slowly. They are more alkaline (i.e. less acidic) which is why they can support more types of plants than those found in acidic bogs. Sometimes, fens have trees growing on them too. Generally speaking, when you think of a fen, think of a lovely green area covered with a mosaic of plants, but that is best to look at from a dry trail! If you try to walk through the lovely green fen, you’ll be knee deep in their saturated, mushy soils getting cozy with all the plant roots! A mucky time indeed! Still not sure of the difference between a fen or a bog?? Click here to learn their distinctive characteristics. Marshes are shallow ponds covered by reeds and grasses. The water levels fluctuate seasonally and in NWI are the “inland” category rather than tidal marshes found along ocean coastlines. You may often find a marsh at the edge of a lake, slowly closing in around it. In contrast to bogs and fens, marshes do not have peat moss and a fed by surface waters as well as ground waters. 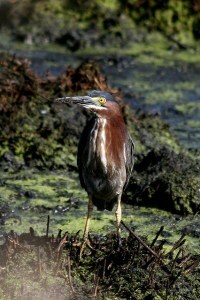 Marshes bring to mind the Great Blue Heron as well as wading birds which can often be found nesting among the reeds. Swamps are dominated by trees and shrubs. They are fed by surface waters and often have standing water. NWI boasts some incredible examples of swamps. My favorite time to view a swamp is on a foggy morning when the air is still and the sound of great blue herons flapping their wings as they fly to their nesting trees is nearly all that you hear. Swamps have so much character and provide the backdrop or inspiration for great stories. Swamps bring to mind primeval landscapes, Swamp Thing and curious life forms. Pannes are rare wetland habitats found on the back side of dunes that line the lakeshore. They are shallow depressions that are naturally irrigated by groundwater. Pannes support over 200 native plant species in addition to reptiles and amphibians that are only found in the Great Lakes region and Cape Cod! They are a conservation priority for Save the Dunes and our partners and lots of work is underway to preserve, protect and restore these gems. When water is stored in wetlands, the water slows down. Slow moving water has less erosive potential. High water storage capacity also reduces flood heights, allows groundwater to recharge and maintains surface water flow during dry spells. At the landscape level, a network of many small wetlands has the capacity to store large quantities of water. This function can be directly translated into saving money from potential flood damage (EPA, Function vs. Value). Sediments carried by water slowed by wetland plants may be taken up by plant roots and other creatures in the soils. If the water contains pollutants from agriculture or leaking septic tanks, it can be absorbed by plant roots and microorganisms before the water leaves the wetland. In the case of NWI, this means that the quality of Lake Michigan water is greatly improved if water destined to enter the lake first flows through a wetland. In fact, some communities have constructed wetlands specifically for storm and wastewater treatment before entering a larger body of water. They regulate water levels within watersheds, purify water, reduce damages from floods and storms, provide habitat for fish and wildlife, and support outdoor recreational activities such as bird watching, fishing and hunting (EPA, America’s Wetlands). The hydrology of an area affects soil development and as such, the types of plant and animal communities that it supports. Long-term saturation of soils creates conditions favorable to plants with specific types of adaptations that in turn affect soil development (EPA, America’s Wetlands). Variation is due to not just vegetation, soils and hydrology, but also topography, water chemistry, and human disturbances. Variation is now also impacted by climate change through changes to precipitation, temperature and frequency and severity of high-impact weather events (EPA, America’s Wetlands). The value of wetlands lies not just in their ability to moderate floods, store and purify water or support wildlife. They are also amongst the most productive ecosystems in the world, similar in the productive capacity of tropical rainforests and coral reefs (EPA, America’s Wetlands)! The EPA has referred to wetlands as “Biological supermarkets.” This is because plants produce large amounts of food that attract lots of animal species. The cycle begins with dead leaves and stems breaking down into small particles of organic material in the water called “detritus.” This detritus feeds small insects and other creatures. The small insects are food for larger animals including reptiles, amphibians, birds and mammals! Thus the water held on the land actually holds the key to an abundance of life (EPA, America’s Wetlands). Our wetlands protect us from climate change by reducing the amount of carbon dioxide (CO2) released to the atmosphere during decomposition. The decaying material that is layered and stored in the wetland soils, traps carbon for long-term storage, essentially locking it away from decomposition and therefore preventing the release of CO2 during respiration. Cellular respiration is the biological mechanism that breaks down organic material into usable energy to power metabolism. The end product is carbon dioxide which is released to the atmosphere to complete the natural carbon cycle. This process is universal for all aerobic (exposed to the air) environments. However, in wetlands, decomposition is slowed down, and for material that is resistant to decay, decomposition is essentially prevented! This traps carbon in the earth sediments, where it cannot be released as CO2 and affect climate. Wetlands therefore help to mitigate climate change. Wetlands are particularly susceptible to the impacts of climate change because of their connection to hydrology. While drought exposes wetland species to invasive species encroachment, extreme weather events and flooding can alter habitat structure. To better understand the impacts of climate change on habitats of the Indiana dunes, Save the Dunes initiated a project to identify vulnerable and resilient habitats and species, forecast species that we expect to lose and new ones we expect to migrate into this region, and develop restoration and management plans based on the abilities of our natural communities to withstand the impacts of climate change. In partnership with land managers and scientists across the Calumet region, Save the Dunes and the Field Museum developed the Indiana Dunes Climate Change Adaptation Plan, an action-oriented plan based on existing research, planning workshops, local expertise, and present conditions and realities, which provides land management and restoration strategies for increasing resiliency in natural areas of the Indiana dunes region. Head out to Cowles Bog to view a spectacular succession of habitats from fens, bogs, shrub swamps, marshes and interdunal wetlands. This is the most biodiverse site in NWI and a favorite destination for plant enthusiasts. So, go outside and visit a wetland today!